24 h après la commande, livraison! Donc satisfait Le matériel est bon ! We offer several ranges of round and octagonal trampolines so that you can find the range that is adapted to your needs ! There are 4 different ranges, the Initio range for small children, the Jump’Up range for children and beginners, the Booster range for dynamic teenagers and freestylers and the Waouuh range for sporty children, teenagers and adults. You will be able to find a trampoline that is adapted to your family’s needs. Find the range that is adapted to your needs! All of our trampolines are designed using quality materials so that the trampolines we have on offer are synonymous with safety and durability. All of our trampolines are equipped with an enclosure to provide extra safety when the trampoline is in use. Trampolines There are 63 products. This basic pack includes the Jump’Up 300 trampoline, its safety enclosure, a ladder and an anchor kit. These are the essential trampoline accessories. This maxi pack including a 10ft round, family sized trampoline will allow you to optimise the space in your garden and protect your trampoline from he wind, rain and sun! 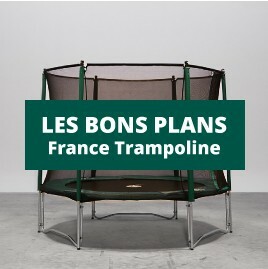 Small rectangular trampoline for semi-professional use which is suitable for all gardens.